If you're in search of a casual yet stylish ensemble, consider wearing a black leather biker jacket and a Rag & Bone Brandy Rib Knit Midi Pencil Skirt. Both items are totally comfortable and they will also look great when worn together. And if you want to instantly amp up the style of your look with one piece, add black suede ankle boots to the equation. For a smart casual getup, consider wearing a black turtleneck and a Rag & Bone red pencil skirt — these items play really nice together. Dress down this look with tan leopard slip-on sneakers. 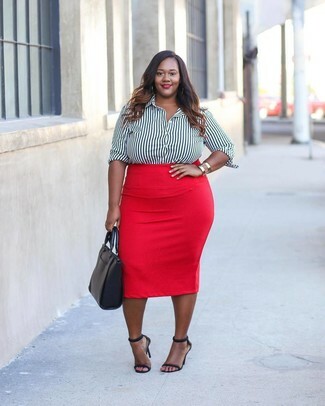 For a smart casual getup, make a white and black vertical striped dress shirt and a red pencil skirt your outfit choice — these two items fit perfectly well together. Black leather heeled sandals look amazing here. For a casual stylish look, consider pairing a navy long sleeve blouse with a Rag & Bone Brandy Rib Knit Midi Pencil Skirt from Neiman Marcus — these two items play perfectly together. Consider tan suede pumps as the glue that will bring your outfit together. For a knockout-meets-stylish ensemble, consider pairing a beige long sleeve blouse with a red pencil skirt — these two pieces the place of work really great together. Black leather double monks are a savvy choice to finish off the look. If you're searching for a casual yet totaly chic outfit, opt for a white crew-neck t-shirt and a red pencil skirt. Both pieces are super comfortable and will look great together. A cool pair of black leather heeled sandals is an easy way to upgrade your look. For a smart casual look, go for a pink long sleeve blouse and a red pencil skirt — these pieces the workplace beautifully together. 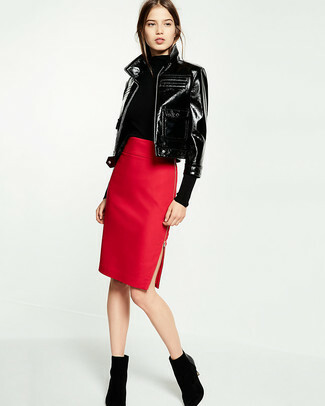 If you're in search of a casual yet chic getup, team a red suede biker jacket with a Rag & Bone red pencil skirt. As well as totally comfortable, both of these garments look stunning together. Take a classic approach with the footwear and make black studded leather pumps your footwear choice. If you're on the lookout for a casual yet stylish look, wear a white sleeveless top with a red pencil skirt. These garments are totally comfortable and they also look incredible when worn together. And if you want to instantly bump up the style of your look with one piece, add tan leather pumps to the mix.